Execution is where state authorities kill someone for having committed an extremely serious crime, usually treason or especially terrible murders. In most countries where the death penalty is still provided for by law, using it is an option available to the sentencing judge: even if the jury or judicial panel recommends the death penalty, the presiding judge still has the option to lock the convicted person in a prison for the rest of their life. Lady Jane Grey, a probably innocent Queen of England is beheaded. Beheading means cutting the convict's head off. It is one of the oldest execution methods and already mentioned in the Bible. Beheading used to be the standard method of execution in Scandinavia and Germany. Commoners were usually beheaded with an axe and noblemen with a sword. A special device, like guillotine, can also be used, as in France. Nazi Germany used guillotine to execute criminal convicts, such as murderers. Centuries ago many countries used beheading as an execution for important people, including England. In England, many noblemen and even some kings and queens have been beheaded. There, the prisoner would be led up the scaffold and usually say a speech. Then, he/she would be blindfolded and put his/her neck onto a block. Then, the executioner would lift up his axe and swing it down onto the victim's neck. If the executioner was skilled and the axe was sharp, then the axe would usually cut through the bone and organs of the victim in one stroke. But if the executioner was inexperienced, then it may take many strokes before the head would be cut off. 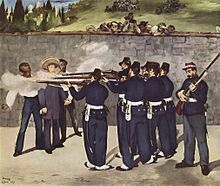 The Execution of Emperor Maximilan of Mexico is a painting by Edouard Manet. It shows a firing squad. Lethal injection: Killing a person by placing several poisons in their blood. This is used as the choice of execution in most U.S. states that allow executions. Gas chamber: A person is placed in area where the air is filled with bad gases until he cannot breathe and dies. This method was used for executions in some U.S. states, and for mass murder by the Nazis during the Holocaust. Electrocution: Killing a person by placing them in an electric chair and giving them a very high electric shock. Firing Squad: Several people shoot and kill a person. Armies around the world have long used this method, since guns and bullets are readily available. Firing squad was the lawful means of execution in Finland until 1944, when death penalty was abolished (stopped by the law). It was also used in the state of Utah in the 20th century. In most cases, not all the shooters have real bullets. After the execution, it is not possible to determine which of the people firing killed the person just executed. Garroting, a method of strangulation used in Spain for hundreds of years. Crushing, also called pressing: used in the common law legal systems. A defendant who refused to plead ("stood mute") would be subjected to having heavier and heavier stones placed upon his or her chest until a plea was entered or the person suffocated. Hanging: Using a rope to either break the convict's neck or to choke (strangulate) him. Widely used around the world until the 20th century. Still today in use in some countries, such as Iraq, Singapore and Japan. Cruxifixion: This method means nailing the convict on a cross. It is considered as the most painful and nasty method of all. It was used by the Romans to punish traitors, rebels and runaway slaves. Death by this method may take days. The convict dies from blood loss, slow choking, loss of water and fever caused by muscle cramps. Besides the Roman and Persian Empires, this method was also used in feudal Japan.